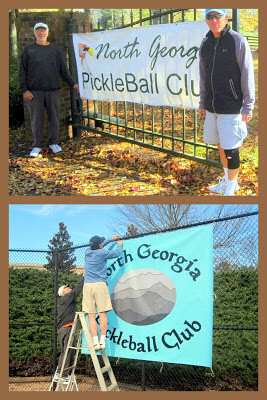 North Georgia Pickleball Club gets new Club Banner! Thanks to Floyd Moody (Moody Graphic Designs) in Ball Ground, we "retired" our 5+ year old club sign in time for our "Great Pumpkin Pickleball Tournament" on November 17th and 18th. Seen with our new sign (bottom photo) is Tom Earley (left) and Floyd Moody on the ladder. The club logo was designed by Moody Graphic Designs. The old sign (top photo)will be used one last time at the entrance to the tournament. By the sign is (left) Tom Earley and (right) Bill Hess. More than 60 players are expected for the two day tournament. Over $1,200.00 was collected for entry fees and will be presented to the Cherokee County Humane Society.